The Global Reporting Initiative has been around for decades. It is widely used, but perhaps still not enough. Often, when we talk about social enterprise and the “impact sector” we conveniently (or naively) overlook the kind of organization that arguably has the greatest scale potential for impact. A large corporation. Generally, corporations are perceived to be bottom-line focused. And in general, this is true. But it’s also a reality that is less and less black and white. In those growing grey areas there is an emergence of new concepts and strategies embracing, for example, a triple-bottom-line and the creation of social value. In order to hold players, new and old, accountable to their claims of impact, frameworks of accountability are needed. Enter the Global Reporting Initiative. 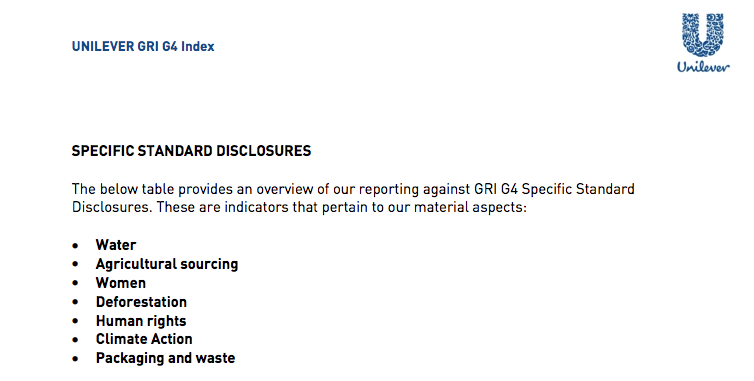 The Global Reporting Initiative (GRI) is an independent organization based in the Netherlands which facilitates standardized reporting for businesses across a number of sustainability metrics. Their standards have become some of the most-used across the world. A KPMG survey found that 6 out of 10 companies who conduct corporate responsibility reporting, use the GRI guidelines as their standard of choice. What’s more, of the largest 250 companies in the world, 93% report on sustainability, and more than 80% of those companies use the GRI standards to report on their impacts. Why Use the Global Reporting Initiative Standards? The standards are a public good for the public good. Freely available, they help organizations frame impact reporting in a standardized “language” that is both understood and accepted as a form of reporting across sectors and across the world. Let’s think about the benefits from different stakeholders’ perspectives. On an internal level, employees attempting to implement a GRI reporting program have a comprehensive framework already built for them, with a huge amount of resources online to ensure successful execution. On a broader internal level, using GRI standards for impact reporting helps give all employees a clearer sense of an organization’s purpose and commitment to beyond-bottom-line impacts. In a world where more and more employees seek “purpose-driven” businesses to work for, more companies need to be doing this. Of course, in an authentic way. Looking to the investor side of things, GRI reporting helps give such stakeholders more confidence in the long-term viability of an enterprise (ideally) if they can see value creation across a number of capitals, from financial to intellectual, human and social, and more. 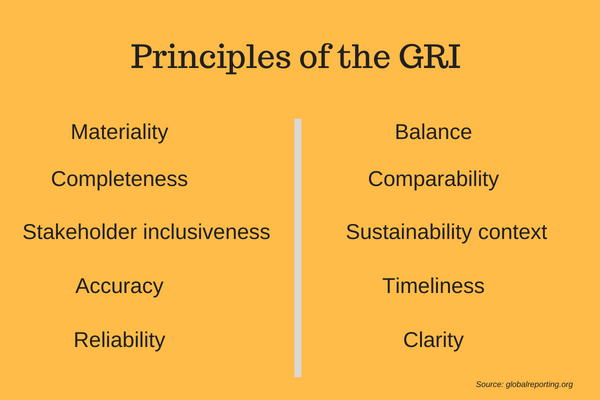 There are numerous other reasons to use a standardized reporting framework like the GRI. But put simply, it helps creates value. For you, your company, and everything it touches. This online public database includes nearly 50,000 reports that include GRI standards as a base for how some impacts are reported. The database includes reports by companies such as Unilever, one of the world’s largest corporations, and one making massive strides to create value beyond the financial across its many verticals. You can find their most recent report here. Taking a brief look into it, we can see how the GRI standards were used to report on both impacts and processes in the reporting year. The second section dives into those metrics used to account for impacts on material aspects as defined by the company (see photo below). Next to each G4 guideline is a link to the information relevant to it. Stakeholders of varying levels of influence all have access to this report and therefore access to the efforts (and progress) Unilever is making towards its social and environmental impact goals. The GRI Standards and Disclosures can also help businesses conduct successful business reporting in alignment with the Sustainable Development Goals. The GRI has done a considerable amount of work to encourage private sector participation on the road to achieving the SDGs. For example, to get started and/or continue reporting in alignment with the SDGs, companies can use a resource co-developed by GRI called the SDG Compass. This resource includes a comprehensive inventory of business tools -- different frameworks, assessment strategies, etc. -- which can be used to help determine a company's impact on any of the SDGs areas. 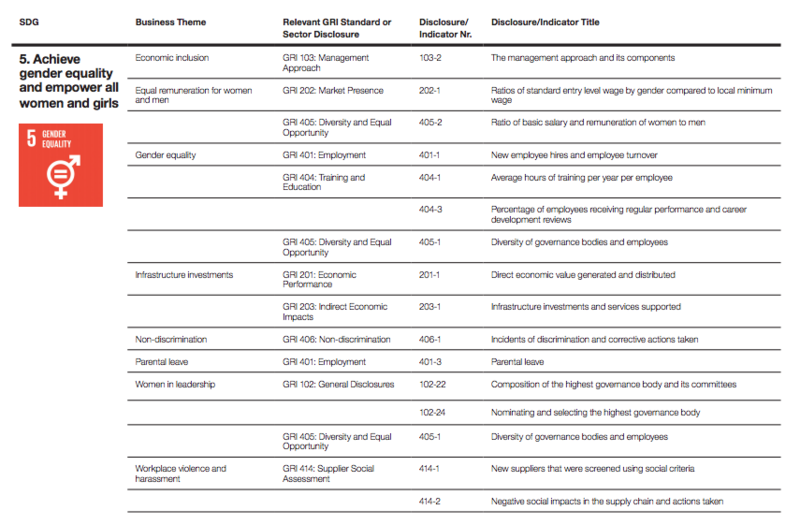 For a more direct comparison between the SDGs and the GRI standards, the SDG Compass group (made up of UN Global Compact and the World Business Council for Sustainable Development) also developed a report which goes through all the SDGs (goal 5 shown below), mapping them to the GRI standards and disclosure which are relevant to each. Working together with the GRI to provide business with the tools they need to be a force for good the UN Global Compact has engaged nearly 10,000 companies of varying sizes in their corporate sustainability efforts. Lastly, the corporate action group, SDG Recording, offers a platform for businesses to improve their SDG reporting literacy through participation in various learning programs, discussions, and live events around the world. The business landscape is changing. From investors to customers to employees -- all across the value chain -- purpose is motivating business decisions more than ever. This means businesses must respond. They must pursue value creation that goes beyond simple dollar signs. As businesses make such changes, exploring the impacts of their operations, inside and out, the evidence of that purpose needs to be communicated authentically, consistently, and accessibly. The GRI standards enable businesses to do that. They are authentic because they are widely accepted as a sustainability-oriented reporting measure. The encourage consistency through a well-established framework, also facilitating comparability from year to year and across companies. Lastly, as we have mentioned, the accessibility of impact reporting with the GRI is clearly demonstrated with every report uploaded to the global database. Transparency grows with each one. So, whichever sector you may find yourself in, or whatever the size of your company, the Global Reporting Initiative can help jumpstart an impact reporting (and impact management) process. If you’ve already begun, it may be what you need to refine that process even more.